Thirty-five years ago by chance I came across a new edition of The Showings of Julian of Norwich. I spent an entire summer reading and re-reading and continuously praying over that mystic's writings based on the revelations she received in 1373 as she lay dying. There are two versions of her revelations. The shorter version—The Showings—were finished before 1390 and were published in Julian's lifetime. A longer version, The Revelations of Love, she wrote after some twenty or more years of reflection on her mystic experience . These were never published in her lifetime and, in many ways, only became available near the 20th century. The latter represented not new revelations but a long, reflective exposition and even profound theological reflection on her original revelations. Julian was an extraordinary woman—most likely a wife and mother; probably a daughter or wife of a wool merchant and, of course, the first woman to write any book in English. 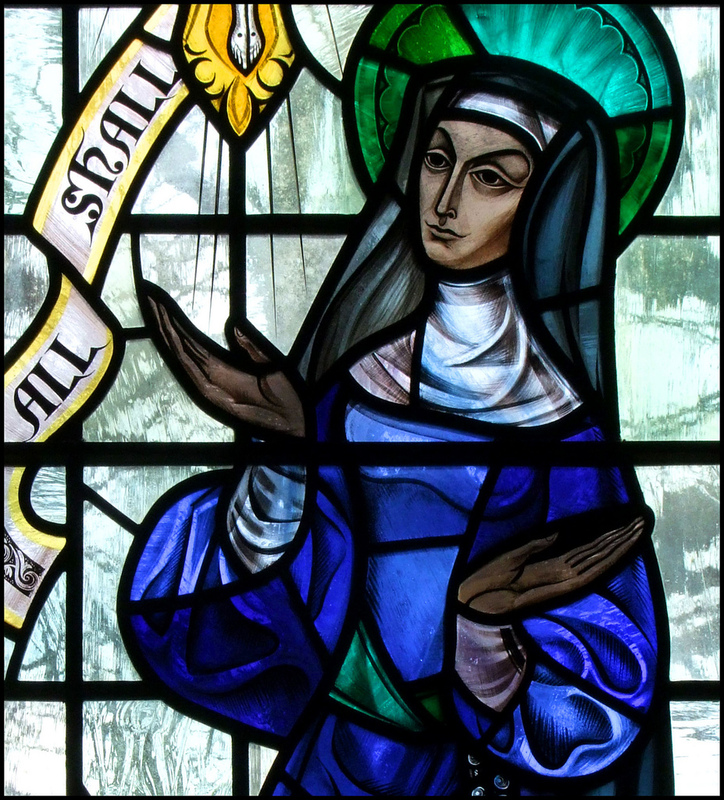 She ended her life as an anchoress in a hermitage next to the Church of Saint Julian in Norwich. The whole world, of course, knows of her well-known lines (which also form lines in T.S. Elliot's poem, “Little Gidding”): "And all shall be well and every manner of thing shall be well." In many ways, Julian, who once said she wished she could have been with Mary Magdelene and the other women around Jesus, turned out to write a kind of woman's version of the gospel. I bring her up because I am often asked by people to suggest good reading for Lent and because a new, truly fresh and magisterial, commentary on Julian's revelations has been recently published: Veronica Mary Rolf, “Julian's Gospel: Illuminating the Life and Revelations of Julian of Norwich” (Orbis Books, 2013). It is already in its second printing. Reading Julian during Lent is also appropriate since her visions began as she lay dying and a crucifix was held before her. She saw nothing except the image of the cross in a transparent light and heard Jesus speak to her about his passion and death. She saw red blood trickling from his crowned head. The blood clotted on Jesus reminded her of the scales of a herring (a common fish eaten in Norwich). She came to see that "he [ Jesus] is our clothing, that for love wraps us and winds us, embraces us and totally encloses us, hanging about us for tender love." Eventually, Julian realizes that there is no wrath in God only love. Jesus shows her a blissful face and tells her: "Where is now any point of thy pain or thy grief ? It is a joy, a bliss and endless delight to me that ever I suffered my passion for thee and if I might suffer more, I would suffer more." For Julian in her revelations sin was never shown. For her, the love by which Jesus suffers the pains of dying surpasses any of those pains. Julian writes using vivid imagery (a hazelnut; a point in space; a parable of The Lord and his servant, the latter buried in a ditch; drowning in the broad waters off Norwich which so often flooded; the motherhood of Jesus). Julian speaks of three aspects of Christ's face in his passion: (1) The bloodied face of the passion which can lead to our sorrowing. But the same face is a source of great gladness and joy for all humanity—for he is the savior of all; (2) The face of Jesus' pity, sympathy and compassion. This is the face he shows to all who love him and have need of his mercy (3) His blissful visage: "As it shall be without end and this [ blissful face] was most often shown me and the longest one confirmed." According to Julian, the Lord wants us to know four things: (1) He is our ground from whom and through whom we have all our life and our very being; (2) He protects us powerfully and with the greatest mercy even when we are mired in our own confusion; (3) He courteously "keeps us and makes us know that we go amiss." For Julian, Christ is our watchful mother. (4) How faithfully he waits for us: "For he wills that we be turned and oned to him in love as he is to us." Indeed, for Julian, we are the treasure hidden in the ground of God's love from all eternity. "For our soul is so deeply grounded in God and so endlessly treasured that we may not come to the knowing thereof until we first have knowing of God." Jesus grants us a fair, delectable and spacious place in the wound at his side. Julian's treatment of the motherhood of Jesus goes far beyond where other visionary nuns or mystics, such as Richard Rolle or Mechtild of Magdeburg, ever went and for whom God's motherhood was a mere metaphor. In the course of reflecting on her revelations, Julian came to realize that since the Second Person of the Trinity gives birth to the entire creation ("for in him all things in heaven and on earth were created") that Christ must be our essential and truest mother. Julian centers her maternal theology entirely on and within the Trinity, in the on-going act of creation and in the divine process of one-ing. She considers the Motherhood of the Son of God as perfectly equal to the fatherhood of the Father. God is our mother as truly as God is our father. All that exists and is good reflects God, mothers as well as fathers. For Julian, Christ's motherhood is not a mere metaphor. It is part of divine revelation. Julian never sees sin in her revelations or hell or purgatory—and is puzzled. How shall all be well if there is sin? She also never saw Christ on the cross attaching any blame to human beings for their sins. She appeals to two domes or judgments: That of the church reminds us of our sins and need for repentance and that of Jesus at the last judgment when he shall make every manner of thing well. Jesus refuses to tell her how to reconcile the two. She holds on to both, hearing Jesus tell her: "That which is impossible to thee is not impossible to me." We actually know little about Julian. We are not even sure that was her real name, since it might have accrued to her as an anchoress attached to the Church of Saint Julian. The genius of Rolf's commentary is the way she retrieves much that did happen in 14th-century Norwich to throw light on Julian's writing. There was the Hundred Years' War, The Peasants' Revolt, the deposition of Richard II, papal schisms. There were repeated bouts of the bubonic plague (where so many died, perhaps also a child of Julian which helps explain one otherwise obscure passage in her revelations). It was the time of Wycliffe and the Lollard heresy. So we can understand why Julian did not publish the longer revelations in her lifetime lest she be suspected of being a Lollard. We do know she was visited in 1413 by another English (but more problematic) mystic, Margery Kemp. Rolf's commentary tells us how a woman could have gained some knowledge of reading and writing and a deeper knowledge of theology (due to a new kind of preaching by the friars). Most intriguing, Rolf recounts the N-Cycle of Mystery plays (like those famous ones in York and Chester) which likely too place in Norwich and with some of whose lines the writings of Julian show some resonance. I can hardly think of a better book to read carefully ponder and pray over often during Lent than Rolf's Julian's Gospel.